We all have unreachable dreams. The ones we long for. Long to touch, see, feel, hear, smell, experience with our whole body but we won’t. Why? That dream is on a pedestal, priceless. It would be more terrifying to have the dream become a reality and disappoint you than to try to attempt that dream in the first place. Kruger National Park – African Safari – and the big five, was a dream i thought i would never experience. There are no words that could form a well enough sentence to portray exactly how BIG this dream was to me, it was the experience of a lifetime – I was about to experience what i grew up watching on David Attenborough’s Shows. 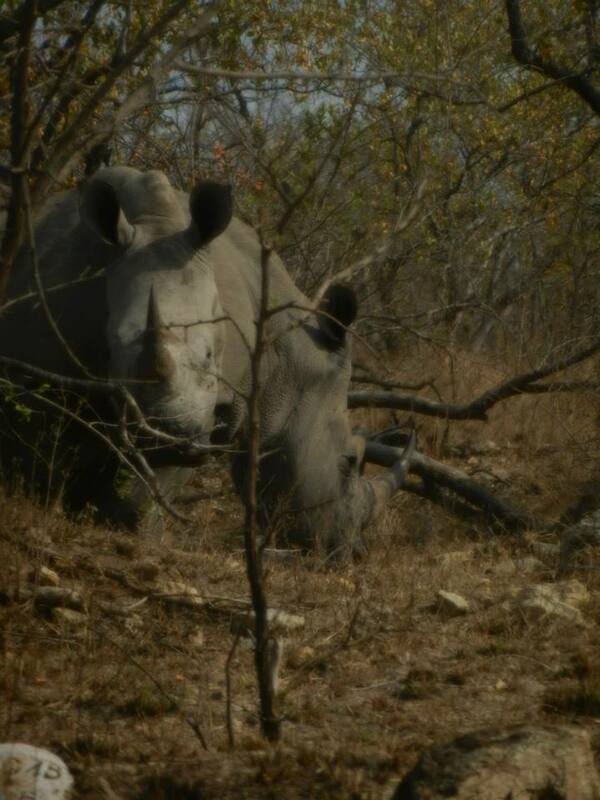 Rhino’s hiding in the bush in Kruger National Park. Crossing the Zimbabwe/South African Border was a long – painfully long – process, we all had to make sure we had the appropriate paper work with us, mainly to prove we had been inoculated against numerous diseases – considering the ‘toilet’ had a ‘warning cholera present’ sign, I was glad I had – and even though being asked numerous times, a few people in our tour group didn’t – and were put in holding cells, it was kinda funny, they laughed later with us, I promise. – safe to say the crossing took a little longer than expected. Lesson everyone, when advised by doctors to get a jag, don’t ignore it. Apparently African Border holding cells are not much fun. Moving on from the South African Border – and cholera warnings – We entered Kruger National Park. I did not realise just how big this park was, I mean, it’s the size of Israel apparently! My eyes were peeled open, I wanted to see something, anything. It was ridiculously exciting. I felt like a little kid in the middle of a sweet shop running from one box to the other grabbing everything. My eyes were looking everywhere! Clearly being over excited on a safari has its disadvantages, you are so excited to see something, you miss everything. All that could be heard from our (awesome) tour guides were, ‘GIRAFFE ON THE LEFT’ – we all missed it – ‘ELEPHANT ON THE RIGHT – we all missed it again. Hopeless until we calmed down. When we finally managed this. What we saw just blew me away. My expectation was I would turn up to Kruger and animals would be everywhere – very naive – but they are hard to spot. Everyone wants to see the Lion, Elephant, Hippo – I just wanted to see anything, big or small. I was not disappointed. Rolling through Kruger National Park was indescribable, how do you describe to someone well enough how it feels to have one ultimate lifetime dream, an untouchable dream, come to life? You quite simply can’t – for an Animal lover like myself, it was impossible – I was speechless to Africa. Setting up camp in the middle of Kruger National park was exciting and terrifying. No, we did not camp in the middle of the park with just tents. We were camping in the middle of the park in a very large – ‘Cage’ – campsite, with very high electrical fences around it. If you ever want to experience what Ice Cream feels when we gaze at it hungrily, step right up my friends. As soon as the sun started going down the Hyenas were running around – and around – the Campsite, chattering excitedly, gazing longingly at us – and appreciating the idiot tourists throwing food scraps over the fence, don’t do this – dying to figure out a way to get in. This was the strangest role reversal I had ever been in. Hyenas are also, A LOT bigger than I thought they were. So this set us up nicely for our Night Safari. Leaving the ‘Truck‘ behind we approached our Vehicle for the night, open back jeep. Very Exciting – until I thought about the hyenas waiting for us. Setting off into the dark, with just flashlights piercing small pockets of light into the dark, we were on a quest to hopefully see some nocturnal animals – we all really wanted to see lions – at work. Safe to say we weren’t disappointed. This lioness was on her own, wandering the track in-front of our Safari Truck, barely noticing us at all. Our guide told us she was probably wandering alone as she has just had her cubs – at this time the lioness and cubs often hide away from the pride to ensure the safety of the cubs from other males – and was now out to hunt. Sadly she wandered into the bush, off where we couldn’t follow. But she did lead us to a mother Elephant and her Calf, not overly pleased to see us, but it was amazing to steal a peak at the baby Elephant before moving away. Night safari, spotting lions at Kruger National Park. Being out at night on the jeep safari was amazing, but it wouldn’t have been the same if we hadn’t of broken down. 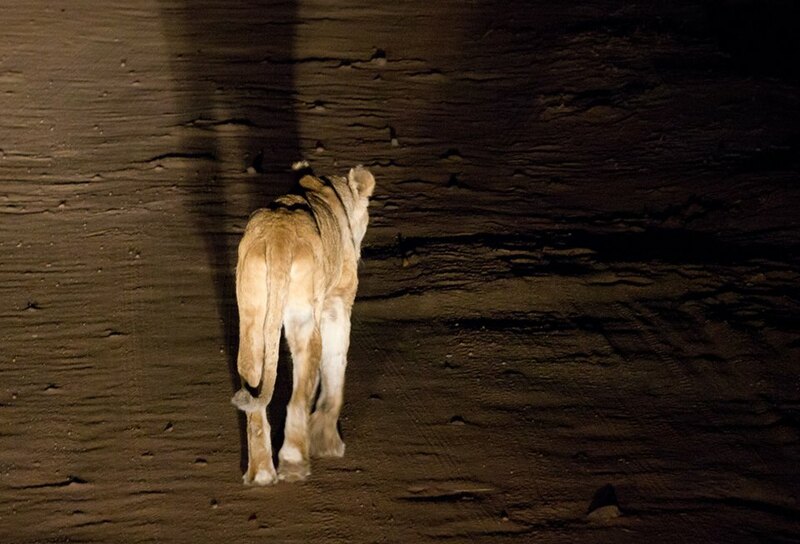 We were stuck, in the middle of the African bush, in the pitch dark, not far from the Lion we had just followed and the Hyenas that had just run across the road. This is the most hilarious and precious memory I own. Instead of everyone getting freaked out, we proceeded to talk about how this would, one day be made into a movie with a star-studded cast playing us – I decided Scarlett Johansson would play me, obviously – and it would be a blockbuster best seller. This kept us going until we transferred onto our replacement Jeep and we made out way back to the Campsite. The morning was full of chatter about what we saw the night before and what we would like to see today. Why did the Elephant cross the road? 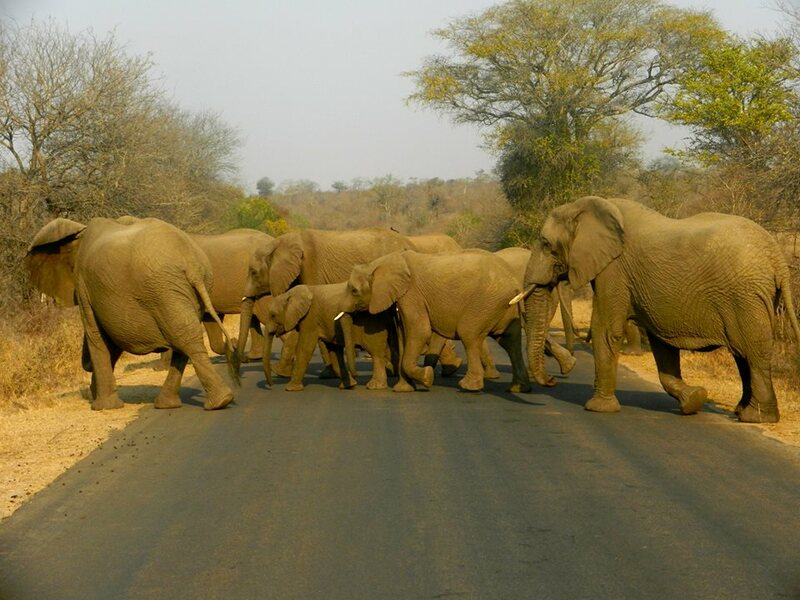 Elephant crossing at Kruger National Park. We saw A LOT of Elephants on Safari. But this was the most breathtaking. Elephants are my favourite animal after all. But to be driving casually down the road and having to stop because the full heard were in movement, there are just no words. I could have cried. It was beautiful, completely unbelievable and just an experience that changes you. We heard over the radio that, Lions had been spotted at the ‘man made’ waterhole – these are all over the park, to help in dry season and to stop the animals wandering out-with the ‘safety’ of the park to find water – as we pulled up, the Lions were just lying there, full from feeding and completely undisturbed by us. Kruger seemed to open itself to you just as you were leaving. The animals presented themselves in numerous bursts – I have a million pictures I would love to show you all – and it was painful to leave this beautiful park. While staying in Kruger National Park, we were taught so much about how a lot of the money goes back into the conservation and protection of the animals in the park. The threat of poaching is so strong in Kruger National Park. It makes me sad to think how a human being could take joy in hacking horns off our Rhinos (Unicorns) and Tusks off our Elephants, leaving them to die, with the excuse of money and ‘fascinating herbal healing powers’ these products possess – which is a total lie. To learn about the problems facing the Park and the Animals living there was sad. Animals are such a big love and passion of mine, it made it even harder to leave Kruger, I would happily spend all my days there. This is fab! The elephants all together crossing the street is my fav!